The marine transportation of containers is a dynamic operation which requires close supervision from the moment the containers are taken under the Member’s care until such time when they are safely delivered to the receiver. It comes as no surprise that the nature of this trade gives rise to a considerably large volume of claims, many of which could have been easily avoided had greater oversight and diligence been exercised. 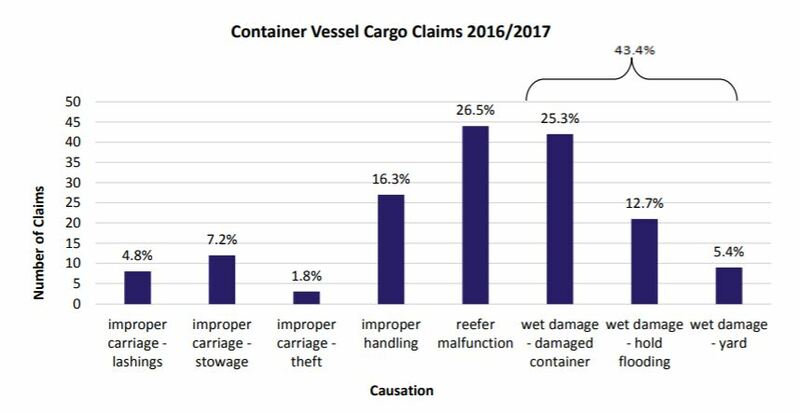 Collectively, wet damage to cargo in containers formed the largest percentage of the cargo claims, with damage to reefer cargoes accounting for over a quarter of all incidents. Other factors, including improper handling, improper stowage and inadequate lashings of containers, have been addressed in this sample risk assessment form. This form is also available in Bahasa and Thai to assist our Indonesian, Malaysian and Thai membership in their specific operations. We would like to emphasise that this risk assessment is for guidance purposes only and it is imperative that operators conduct their own risk assessments based on their individual operating parameters. Members may also wish to consult the Container handbook, published by the German Insurance Association (GDV e.V). The handbook provides guidance for the different types of vessels that are capable of carrying containers, recommendations on the positioning and securing of containers, examples of container stowage plans and causes for damage/loss during transport amongst other detailed recommendations on the handling of containers. Members can also find further advice on the different types of refrigerated containers, including guidance on their carriage and care of product within the container. There is also a section which outlines the climatic conditions that affect the cargoes carried, including care and maintenance required for carriage of specific sensitive cargoes.